Why should the nonprofit sector change what it has been doing for well over 100 years? That she was feeling pressured and under a tremendous strain was readily apparent: you could read it in the lines on her face and in her tired, tired eyes. Not thirty days earlier the county executive had announced the unilateral cancellation of all contracts not deemed “essential;” and a good number of them had been with her agency, one of the largest nonprofit human service organizations in the metropolitan area. It also seemed clear that the county legislature would be making further cuts as it cobbled together a deficit threatened budget for the coming fiscal year. From the state capital there were rumblings of massive imminent cuts in programmatic spending; and a local funder, a bank, had just informed her that it was, in fact, not going forward with a $100,000 grant she had been counting upon. “At a time like this,” she said to me wearily, “the last thing we can be concerned about is performance and quality.” The irony of her statement obviously escaped her, focused as she was upon explaining to me that the results and outcomes training for which I had been contracted by her agency was not going to occur. In the privacy of my own thoughts I wondered Well, if not quality and performance, what are you concerned with? The answer, of course, was survival….the survival of her programs, the survival of her staff and payroll…the survival, perhaps, of her entire agency. While this particular drama was being played out in but one city in but one state, it has had echoes across the country as the current economic downturn (never mind that the economists tell us that the recession is over!) is pressuring nonprofits of all shapes and stripes and of every conceivable mission. As my former client might have put it, At a time like this, when we are fighting so hard just to survive, is it right, fair, or even necessary for us to be burdened by having to demonstrate the “outcomes” of the very good and valuable work we have been doing for decades or more? In the opinion of many, that is a valid question; and from a historical perspective, it is a fair one as well. While organized social and relief efforts of charities and religious institutions easily date back to the mid-19th Century, for a variety of reasons the question of effectiveness was slow to be asked. As the mindset of the Progressive Era (≈1900-1915) came to replace the Social Darwinism of the Gilded Age, the nation’s attention became focused upon the tragedies of slum tenements, the corrosive influence of political corruption, the depredations of the trusts, the abuse of laborers, the despoiling of the environment and threats to public health. Thinkers and reformers came to see society’s ills as reflecting societal -and not as individual- failures; and as a response they designed and put into place a host of programmatic responses across a wide array of fronts. The government stepped in to protect natural resources and the quality of the food supply. Social welfare organizations like the Salvation Army spread to and across America. Fraternal organizations like the Odd Fellows, the Freemasons and the Knights of Columbus extended their influence. Religious inspiration, self-improvement and civic engagement were closely intertwined throughout this period. However, at the same time, three characteristics worked against the development of a strong tradition of assessing the impact of these efforts. The first (and especially if we cast our sights farther, into the New Deal) was that these initiatives often relied heavily upon legislative fiat or executive order. From temperance to health, these efforts sought establish rules for general behavior, rather than seeking to change individual behavior. A second factor was their one-size-fits all nature. Programs were designed to address problems, not necessarily their causes. To the extent that they targeted people, they did so as a class or group: immigrant mothers and workers, laborers, residents of a certain region or area. Finally, there existed a faith in the effectiveness of these programs that required little or no “proof.” Programs typical of this period addressed massive issues on a massive scale. Their “effectiveness” was measured in terms of the number of applicants they had, or the number of dollars they disbursed. Both their outcomes and their impacts were thought to be readily apparent; and a specific demonstrations of “outcomes” was not thought to be necessary. Illustrative of this fact is that in his landmark survey of over 60 years of social science writing, S. E. Zimbalist did not find evidence that there traditionally existed any question at all about the effectiveness of social interventions. To the contrary, there was an implicit assumption that armed with an understanding of social problems, social work professionals would have no trouble changing these conditions through the proper policies, actions, programs, and direct intervention. There are many in the sector who continue to believe that questions of demonstrated effectiveness are a burdensome distraction from “the work”; and a number of these observers feel that the “armchair activists, pointing fingers and pontificating from the sidelines” should get out of the way and stop creating new hoops –often in the form of performance standards and demands for evidence of outcomes- through which committed practitioners need to jump to qualify for funding and to have their efforts deemed legitimate and worthwhile. But on the other hand, there are those who believe that the traditional lack of a focus on effectiveness has led to a situation where the stated objectives of many social and human service programs are “are grandiose, but usually vague statements of intent and procedure…based upon largely untested or even unsound assumptions whose validity rests primarily upon tradition or ‘common sense’ and not upon proven effectiveness.”  There are even some who would argue that because of a traditional accent upon caring, commitment, and activity instead of a focus on demonstrated impact, there is not actually any real evidence that any social programs have ever in fact done any real good at all. Somewhere between these two perspectives lie the truth…and the reality that nonprofits across the nation face. It has been called the “battle for the soul of the nonprofit sector, and it represents a reality that concedes that, yes, the implementation and utilization of outcomes does represent a challenge for those who are unfamiliar with its concepts, language, and methodologies, but also one that admits that the world has changed and is unlikely to return to a day where statements of commitment, descriptions of problems, and accounts of activity will suffice for conscientious social investors. That genie is not going back into the bottle; so the question nonprofits ought to be asking is Do we understand the benefits of adopting an outcomes perspective to our work? For most nonprofits, the fact is that a growing number of governmental, institutional, and even individual social investors are asking for evidence of outcomes. Grant applications ask for such information, and project summation reports are expected to contain it. When one considers that Charity Navigator, the nation’s foremost charity rating agency, serving over 3.3 million unique visitors and impacting approximately $10 billion in charitable donations each year, will soon be adding a third component for results to its already formidable assessment system, it becomes obvious that the day is not too far off when most requests for nonprofit funding will be relying in some proportion upon a demonstration of outcomes, impacts, and effectiveness. So perhaps the most basic advantage an outcomes perspective can give to a nonprofit is that it will allow an organization to competently compete for funding dollars in a world that increasingly demands such evidence. A second advantage to be gained from the implementation and utilization of an outcomes perspective is the opportunity for learning. Whatever else an outcomes approach may do for an organization, it is at heart a learning system, delineating precise steps to be accomplished in pursuit of a goal. By matching actual progress against such an explicit roadmap given an organization the opportunity for real-time assessment, the chance to make real-time course corrections, and a way to change program designs in order to do better next time. The potential such a capacity represents can be readily seen in a basic mantra of the powerful and world famous Six Sigma methodology, which constantly reminds practitioners to Define, Measure, Analyze, Improve and Control. 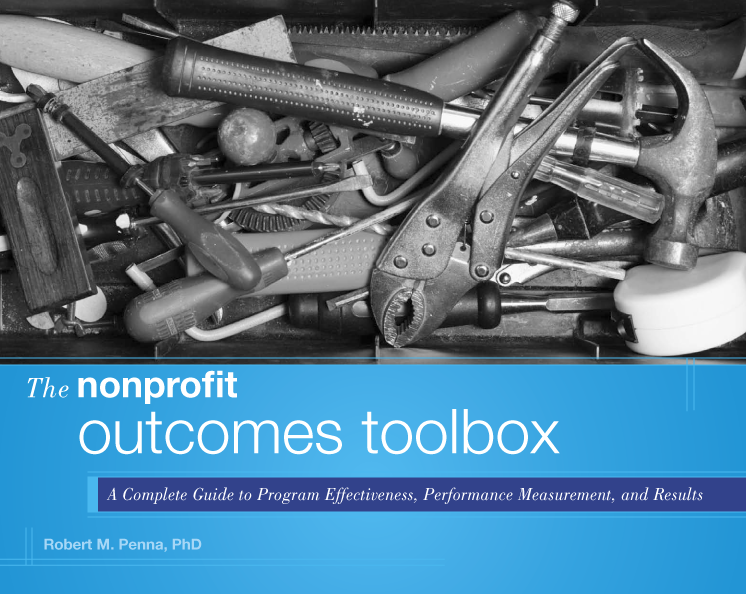 If organizations from GE and IBM to Lockheed Martin and Toshiba have accepted the benefits of using an outcomes approach for learning, the chances are that the nonprofit sector could benefit from using it as well. Finally, a well implemented outcomes approach simply helps organizations design better programs because of the questions it asks, and the before-hand thinking and answers it demands. By mandating a clear well defined goal –the Outcome Statement- by establishing an explicit set of sequential steps and accomplishments to be achieved –milestones and Performance Targets- and by repeatedly asking the capacity question and challenging assumptions, an outcomes approach to our work gives the sector a powerful means of being better at what we do. It is an advantage that we simply cannot not pass up. In the end, the woman who told me that “at a time like this” she simply could not afford to focus on “performance and quality” had it, of course, entirely wrong. It is precisely now, at a time of scarce funding and increased competition, that organizations like hers need to adopt a focus on outcomes. It is precisely now that nonprofits -whether they are engaged in human services, environmental protection, social justice, or advocacy- need to rethink the terms in which they define themselves and their missions; now is the time to step away from the familiar and comforting reliance on commitment, activity accounts, service units, and compliance and toward the brave new world of performance. Unfortunately, at the time that was not a message she was prepared to hear. But it is nonetheless one the rest of us should begin listening to immediately. Gottlieb, H. (2009, October 20). Armchair Change Agents. Creating the Future! Hildy’s Online Journal for the Community-Driven Institute. Available at http://hildygottlieb.com/2009/10/20/armchair-change-agents/. Bravo! This is definitely a common theme we’ve heard since 2007, but the organizations who have made the tough choice to focus on outcomes appear to be the ones who not only survived the worst of the down-turn, but also seem to be poised to thrive now. Thank you for the eloquent historic context and the emphasis on building “learning cultures”…for us outcomes capacity-builders, that is the best we can hope for to truly move the needle on the social issues of the day. Thanks for a very useful trip though history to cast an illuminating light on present circumstances. I would add one point to those you advance concerning why now is precisely the right time to care about outcomes: namely, the people who desperately need effective supports and opportunities from nonprofit agencies to get a leg up on life will be let down again and again by programs that are poorly designed, poorly implemented, and poorly delivered – that, to put it bluntly, therefore don’t work. As you point out, this has been going on for generations, and contributes to the presence of an entrenched class of people living in poverty in the US. The opportunity cost is incalculable in dollars…and indefensible morally. Just saw this and thought this was terrific. Thank you for helping us all to think clearly and cogently about outcomes and let me know when you will be in Texas again – I would like hear your next presentation!